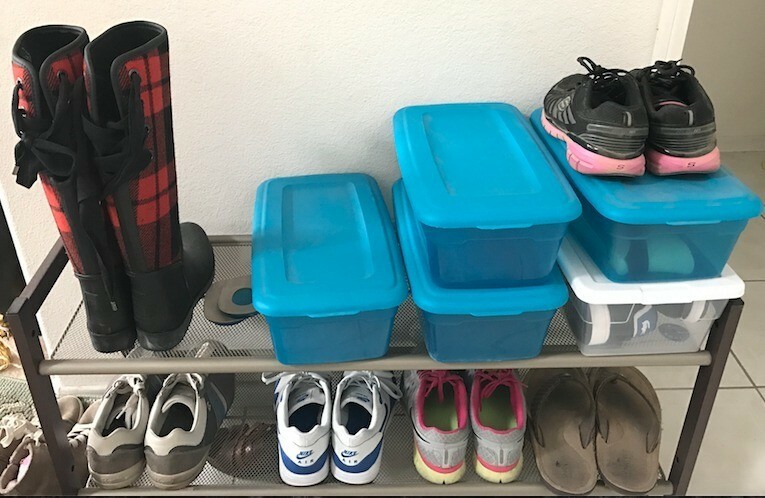 Keep your shoes as good as new in storage by using handy shoebox containers. This is a guide about storing shoes without dust. I store my shoes on two kinds of shoe trees; one is the kind that stands up on the floor and the other is the kind you can hang in your closet or back of a door; either way my shoes were getting dusty. To remedy this I cover each shoe with a plastic bag I get from the grocery store (the bags you get for free to put your produce in) and then store it back on my shoe tree. I also use the bags to stuff my shoes with. And, of course, when I travel I just grab the shoes I'm going to need and they're all ready to pack. Hope you like my tip. Displaying a shoe rack in your closet, home or garage is a lovely way to display your collection but it is not practical. If you have several pairs of shoes and do not wear them all on a daily basis, your shoes will sit and collect dust. When you want to wear the shoes, you would have to wipe them down and it is inconvenient - sometimes even spiders make their webs! To prevent even having to dust, or spiders - you can simply purchase these inexpensive 6 Quart Basic Clear Storage Box with White Lid from your Target, Walmart, Big Lots, Dollar Tree - usually a buck each! Put away the shoes you do not wear often and when you want to wear them, they will be in clean condition. For the other pairs you wear often, you can put them out.